Moore: Americans don't like to be told they can't see something. Moore says Disney has blocked distribution of his new film. 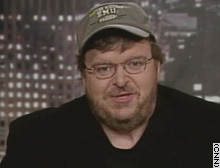 Is Disney justified in blocking distribution of Michael Moore�s new film in the United States? (CNN) -- Oscar-winning documentary filmmaker Michael Moore has said the Walt Disney Company is blocking distribution of his new film critical of U.S. President George W. Bush. He spoke to CNN anchor Hala Gorani about the controversy. Gorani: What was your communication with Disney? Moore: Almost a year ago after we'd started making the film, the chairman of Disney, Michael Eisner, told my agent that he was upset that Miramax had made the film -- Disney owns Miramax -- and he will not distribute this film. Miramax said don't worry about that, keep making the film, we'll keep funding it. The Disney money kept flowing to us for the last year. We finished the film last week, and we take it to the Cannes film festival next week. On Monday of this week we got final word from Disney that they will not distribute the film. They told my agent they did not want to upset the Bush family, particularly Gov. Bush of Florida because Disney was up for a number of tax incentives, abatements ... whatever. The risk of losing this -- we're talking about tens of millions of dollars -- they didn't want to risk it over a little documentary. Arguing Disney's point, Michael Eisner said, look we don't want to take part in a partisan film right before the election in America. So to be fair to the company, if they feel it hurts their bottom line, why haven't they the right to say they don't want to distribute it? Our media companies are invested with the public trust. That trust states that they're there to allow all voices to be heard. We live in a free and open society where dissent is not to be stifled or silenced. They have violated that trust. We have only got a few studios left, right, and if we get to a point where they can decide that only these voices can be heard, how free and open is our society at that point? So Disney signed a contract to distribute this, they got cold feet, they're afraid. Yes, the Bushes will not like this movie ... they will really not like this movie. Because we're going to show things like they haven't seen before about the Bush family, about the war in Iraq and a number of other things. So what's your next step? You don't have a distributor now but you've had so much publicity in the last few days out of this, you've probably had people calling you to say they're willing to distribute this movie and internationally will it be seen? The good news is that internationally we already have distributors in much of the world. So it will be seen outside of America for sure some time this year. But I hope it doesn't happen where an American film maker makes a film about America and it can't be seen in America. What is the message to the rest of the world then? It's not a good message so I'm hopeful we'll shortly have an American distributor. One good thing about Americans regardless of their political stripe is that they don't like to be told they can't see something -- that's what Disney has said. And I'm pretty confident we'll prevail here.